5 Miscellaneous: storage diseases, amyloid, primary and secondary neoplasias, tropical splenomegaly Massive splenomegaly is seen in myelofibrosis, chronic myeloid leukaemia, chronic malaria, kalaazar or, rarely, Gaucher’s disease. Investigation is that of the primary disorder. The spleen can be visualized by ultrasound or CT scanning. Splenic function can be assessed with isotope scanning. Treatment is often dependent on the underlying cause but splenectomy is sometimes required for severe anaemia or thrombocytopenia. 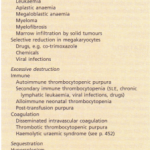 IMMEDIATE: increased platelet count (usually 600- 1000 x 109/litre) for 2-3 weeks, thromboembolic phenomena may occur. LONG-TERM: increased risk of overwhelming infections, particularly pneumococcal infections. Prophylaxis against infection after splenectomy or splenic dysfunction. ABNORMALITIES IN RED CELL MORPHOLOGY are the most prominent changes and include Howell-Jolly bodies, Pappenheimer bodies, target cells and irregular contracted red cells. Pitted red cells can be counted. 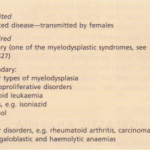 This is seen in sickle cell disease due to infarction. 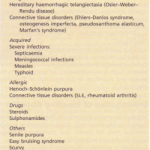 It is also seen in coeliac disease, dermatitis herpetiform is and occasionally in ulcerative colitis and essential thrombocythaemia. 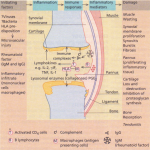 Postsplenectomy haematological features are seen.